White House counselor Kellyanne Conway mocked Rep Adam Schiff (D-Calif.) Tuesday on Fox News, saying he "leaves the house every morning with his earpiece" by going on TV often while slamming Democrats for having "no message" heading into the 2018 midterm elections. "They live on TV, especially Schiff and you know it," Conway told "Fox & Friends." The Republican National Committee released research on Feb. 28 showing that Schiff had conducted 227 television interviews since Jan. 20, 2017, including 111 interviews with MSNBC that lasted over 12 hours. Schiff also conducted 87 interviews with CNN that lasted about 11 hours. In a Sunday interview on ABC's "This Week," Schiff urged voters opposed to President Trump that the best way to battle his agenda is "to throw the bums out" of Congress who support "a deeply unethical president." "At the end of the day, theres only one remedy for that and that is you need to throw the bums out. 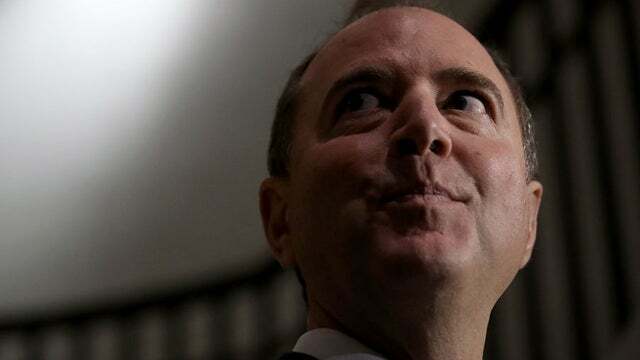 As long as there is a majority in Congress who is willing to do this presidents will and as long as we have a deeply unethical president there is only one remedy," Schiff said. "You see that with Schiff and Swalwell," she said, referring to another Democratic House member, Rep. Eric Swalwell (Calif.), who frequently appears on television. "Its the same thing: attack, attack, divert and deflect," she said. "He wont be diverted or discouraged doing things on behalf of the American people. We are more secure and prosperous because of him," Conway later added. "This is the flailing that happens when you have no message." Conway is right except for their one plan, to repeal the Tax Cut & Jobs Act and raise taxes. "they have no message" around security and prosperity. They have a message, defeatism/leading from behind and raising taxes and enlarging government - these two strategies have improved nothing, people are observant. I disagree, HATE is their message, and they continue to spew HATE All day, Every day. Schiff is a shill for the Deep State. What they are really after is making sure we cannot reverse the demographic changes that have been made to the country against the will of the citizens through bipartisan non-enforcement of our laws and borders. Trump represents the last chance for the citizens to keep their country and the Uniparty knows it. They were this close ‘’ to stealing our country from US irrevocably. PDJT ended the Obama policy of punishing America for its productivity and world leadership. This infuriates the MSM-Democrats, who believe America deserves to be punished for these things. Amen to that. What a total turnaround from the previous 8 years. God I hope US Atty Huber has an Indictment for this clown, for all the Illegal Leaks he provided to the state run media. Well, until she says “schiffor brains” she’s not up to speed yet. But keep it up KellyAnne and he’ll be lookin’ for a safe space. I only hope that President Trump supporters get their family and friends out to vote in the midterms. We meed to give these dirty democrats another beat down. A pleasing thought is old bug eyes sitting in a federal slammer. A pimple in a suit. In the last paragraph I assume Ms. Conway was speaking about President Trump. So when does the full repeal of Obama care happen???? Been waiting over a year..... Won’t go into swamp drainage. He has done a lot of good things, yet basics are basics. So when does the full repeal of Obama care happen???? Been waiting over a year..... Wont go into swamp drainage. He has done a lot of good things, yet basics are basics. Terrible writing by this guy but typical for the leftists at the hill.